‘Living on Hope for a Long Time’ is a 45 minute blindfolded audio walk adapted specifically for Stromboli. It is based on the 1978 Jonestown Tragedy where nearly 1000 Americans committed suicide. Jonestown was a failed multicultural utopia of U.S. citizens who relocated to Guyana in the late 1970’s. Cult leader Jim Jones’ final plea to commit mass ‘revolutionary suicide’ was recorded on the notorious ‘Death Tape’. In ‘Living on Hope for a Long Time’, classically trained soprano vocalist Jennifer Connor transforms Jones’ text from the ‘Death Tape’ into a sonic tapestry of opera riffs, spoken word and musical theater. 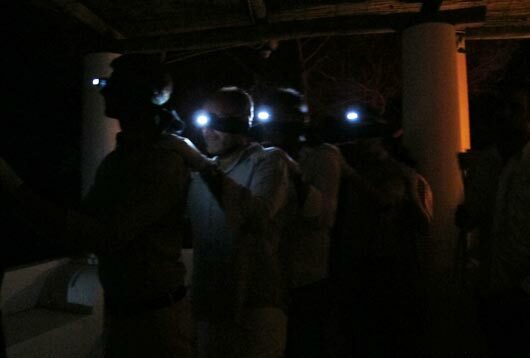 During the Volcano Extravaganza in Stromboli, twenty guests will be blindfolded and escorted in a single-line queue from the House of the Extravaganza to La Lunatica. Video documentation by Vincenzo Simone.